Despite obvious anti-competition concerns, BAA had resisted selling Stanstead to avoid having to unload it in a down market. Now suitors such as Seoul’s Incheon Airport and groups associated with Ryanair are getting ready to bid. London Heathrow airport-owner BAA Ltd. said it will sell the U.K. capital’s Stansted terminal after losing the latest court action against a forced breakup of its assets ordered by antitrust regulators. “BAA has decided not to appeal to the Supreme Court and is now proceeding with the sale of Stansted airport,” the London- based company said in a statement today, while adding that it’s still of the belief that the U.K. Competition Commission failed to recognize that Stansted and Heathrow serve different markets. 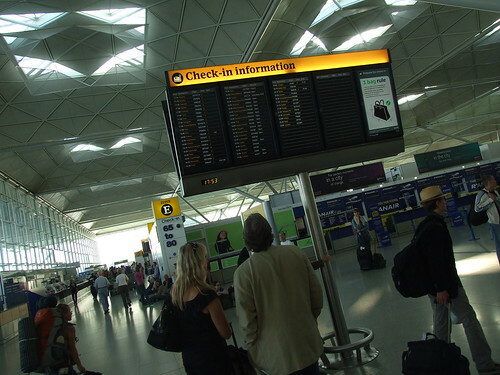 Interior of Stanstead Airport. Photo by Brett Lees-Smith. The decision to sell comes days after Qatar Holding LLC, the investment arm of the Middle East country’s sovereign-wealth fund, agreed to pay 900 million pounds ($1.4 billion) for a 20 percent stake in BAA. Possible bidders for Stansted include South Korea’s Incheon International Airport Corp. and Manchester Airports Group, owner of Britain’s top airport outside London. Stansted, the main base for Ryanair Holdings Plc, Europe’s largest discount airline, attracted 18 million passengers last year, versus 69 million at Heathrow and almost 34 million at Gatwick. It also ranks behind Manchester’s 19 million, though ahead of London Luton and Edinburgh, each with 9.5 million. New York-based Global Infrastructure Partners Ltd., which beat Incheon in the bidding for BAA’s Edinburgh terminal with an 807 million-pound purchase in April, already has two London bases — City airport, located close to the main financial district, and Gatwick, acquired from BAA for 1.51 billion pounds in 2009 — and wouldn’t be allowed to bid for Stansted. Ryanair is keen to take a 25 percent equity stake in Stansted by joining one of six or so groups it reckons might bid, Chief Financial Officer Howard Millar said July 30. Only one or two serious bids are likely to emerge, he added. BAA is auctioning Stansted after the Court of Appeal in London rejected its attempts to halt a sale in a July 26 ruling. The airport operator had challenged Competition Appeal Tribunal findings from February, saying the airport market had become more competitive since the Competition Commission ordered the disposal of airports in London and Scotland three years ago. BAA’s argument against being forced to act during the financial crisis was “a thinly disguised attempt” to prevent a sale at a time not of the company’s choosing, Judge Jeremy Sullivan said, adding that a disposal of Stansted was “in the public interest.” BAA said at the time it would appeal. Incheon has been monitoring the Stansted situation with a view to making an offer should the asset become available, Tae- Soo Yuh, its aviation marketing director, said June 25. Manchester Airports Chief Executive Officer Charlie Cornish said the same day he’s continuing to seek outside funds for the purchase of a “major asset.” He said in 2011 that his company, owned by 10 local authorities around the north-English city, would look at Stansted should it become available. Manchester already runs East Midlands, Bournemouth and Humberside airports. The purchase of BAA itself by Spanish builder Ferrovial SA in 2006 was valued at 10.1 billion pounds. Ferrovial agreed to sell a 5.9 percent stake to Alinda Capital Partners for 280 million pounds in October, valuing BAA at 4.76 billion pounds. Qatar Holding will acquire a 10.62 percent stake in BAA parent FGP Topco Ltd. from Ferrovial for 478 million pounds, the Spanish company said Aug. 17. It also agreed to buy a 5.63 percent stake from Britannia Airport Partners and 3.75 percent from GIC Special Investments Pte Ltd. Editors: Andrew Noel, Christopher Scinta. To contact the reporters on this story: Chris Jasper in London at cjasper@bloomberg.net; Roxana Zega in London at rzega@bloomberg.net. To contact the editor responsible for this story: Chad Thomas at cthomas16@bloomberg.net.